I really like it. Even if the face feels a bit red (probably because I mostly remember Grishnakh from the night scenes. And the base is impressive although I can't remember a fallen sculpt anywhere in there. 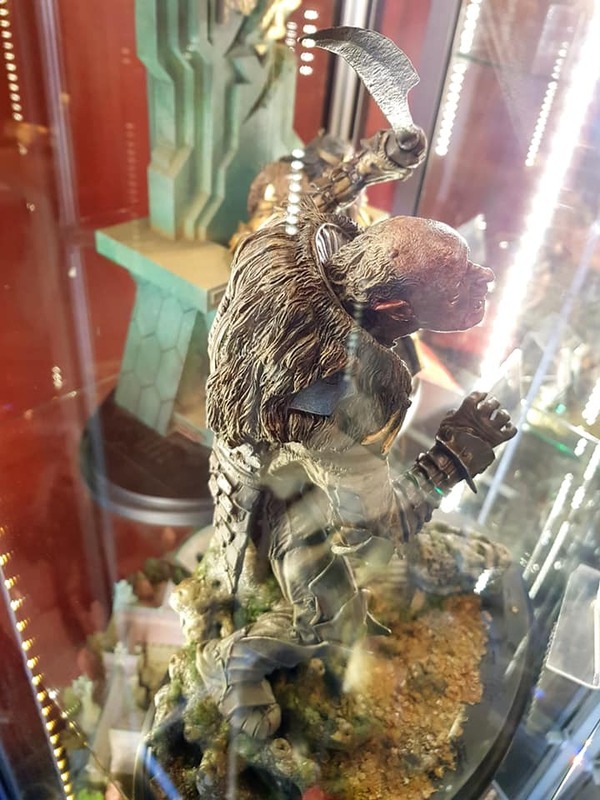 Would love to hear the creative team at Weta ( Leonard ) chime in regarding the base and how they landed on the design on this statue. 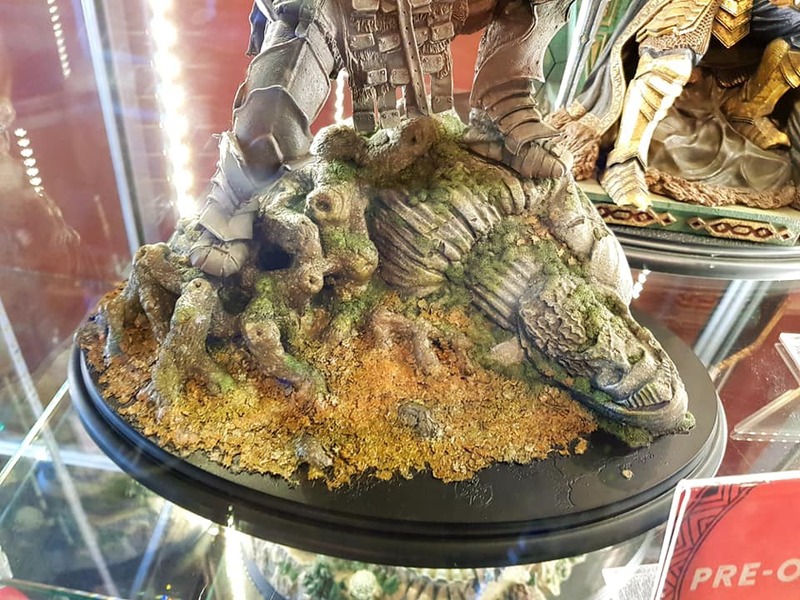 I know an intricate base raises the price of the statue, but I like that they have some environment on them. I looooove the more dynamic bases. They make the piece far more interesting. I think this is just a case of a weird base being chosen for a character. I like large bases full of detail. This base is cool I think, It's a bust of an old Numenorian king covered by old roots and slime, moss. On the ground fallen leaves of autumn. The concept is very nice. The only thing I am not convinced on this statue is his face, all rest is super. Pulled the trigger on this one. I don't have the bust and its overall a cool looking statue. I don't have too many orcs in my collection so I like that I can expand that a little bit. I also liked that there was no deposit with this one. Congrats Josh, I hope you love it!! Great looking piece, but not something I feel the need to rush and pre-order. Might pick it up if it hits a sale at some point however. Beautiful sculpt but was a ruined old statue lying on the ground in Fangorn? Definite buy for me. Jamie has done another awesome job. Looks really great and the base is a win in my opinion. I don´t mind the statue in the base. Yes, it would be nice for a change to go back to plain black bases like in the old days. Unfortunately this Grishnak statue is another reminder that the old days seem to be gone. I mean, really Weta ? After selling a ginormous Treebeard for over 2000 EUR you expect us to get a companion piece of 350 EUR a week later ???? Are you kidding me ? Who can afford stuff like this ? Plus, i have to say the price does not seem right. It´s the same as for Isildur etc. but it looks like there is not the same amount of details happening here that would justify the same price. Nice statue, from the pics i can't spot the supposed wound and orc blood he suffered from the spear? I wouldn’t say it’s a companion piece as he’s in Fangorn and Treebeard is in Isengard. I couldn't find it either. You'd think a wound like that would stand out, so where is it? Yeah, I was expecting one but nada. Thanks!! I think I will. Jamie always does a great job. Plus it gives me something in the spring to review. The pricing may be from the large base, but also the much smaller edition size than Isildur etc? I'm guessing it's not from Fangorn (as you guys have mentioned, there's no injury, and there's a bearded statue which wouldn't be in Fangorn) but it could fit the scene if you wanted it to. 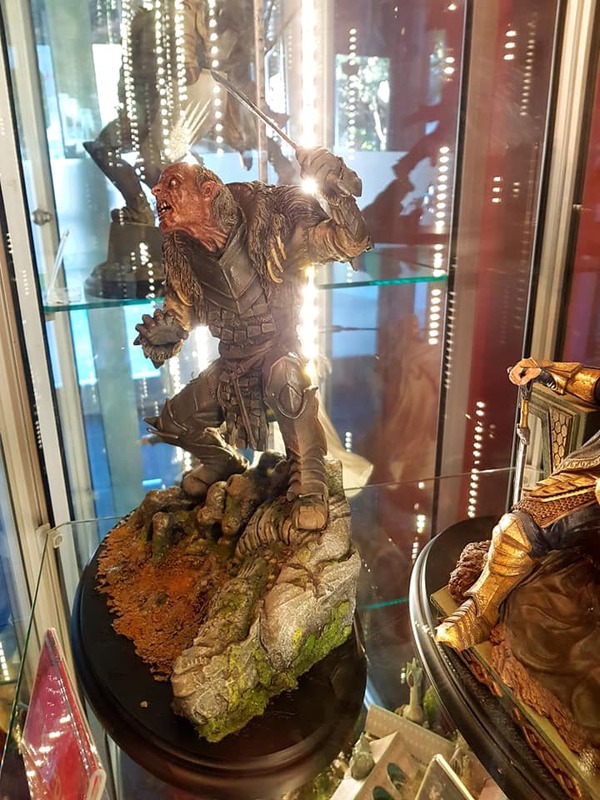 Many Weta statues are not from an exact moment in the movies or books, maybe Weta thought it best not to pigeonhole the character into some particular scene, but to give some freedom in display options by making it a little bit ambiguous like many of their other statues? A "free-range" Grishnakh, if you will! Hey, maybe they wanted Grishnakh to enjoy his own little moment of evil, red-faced, blood-curdling rage all by himself on his own merit! 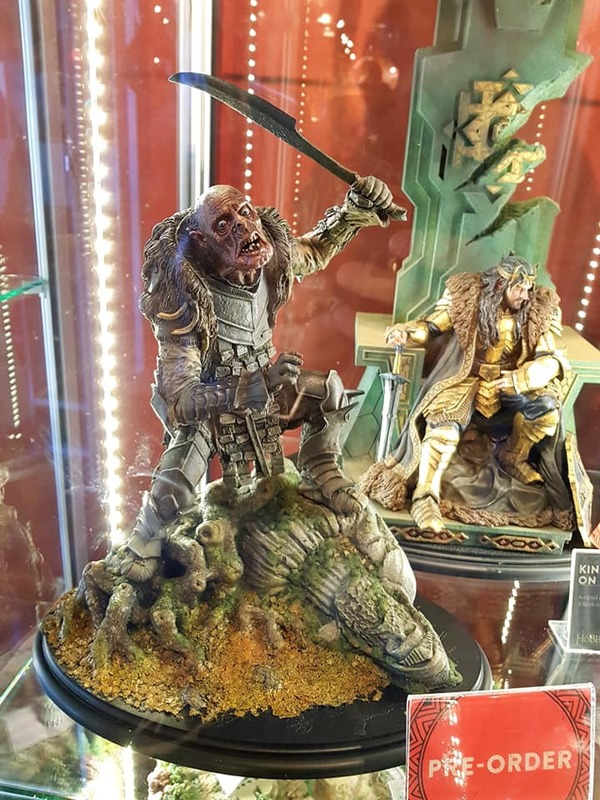 I agree, if it was in Fangorn it would have looked great with a giant tree root alternatively, but regardless of the base I think they've captured the essence of the character well, I love his facial expression, it's a fantastic statue imho! Last edited by Valar; 10th November 2018, 01:51. Grishnákh is brought to you by master sculptor Jamie Beswarick, an accomplished artist who is one of Weta Workshop's longest-serving crew members, being part of the original Lord of the Rings crew. Grishnákh stands complete in 1:6 scale: weapon raised above his captives, moments before he met his death. so it's supposedly from Fangorn, but in that scene only Merry is on the ground and Grishnákh is on his knees bent over Merry and holds his sword another way. the statue also lacks the blood in his face and there are as mentioned no statues on the ground in that scene, at least that can be seen. It could be from when Merry & Pippin tried to escape the orcs outside Fangorn and Grishnákh stopped them, moments before he got impaled by a Rohirrim spear, but in that scene he wielded a knife, and there are no statues there either... I don't mind, I like the statue, I like the bad guys, but it's strange that the description says things that doesn't really match up. These are fantastic shots. 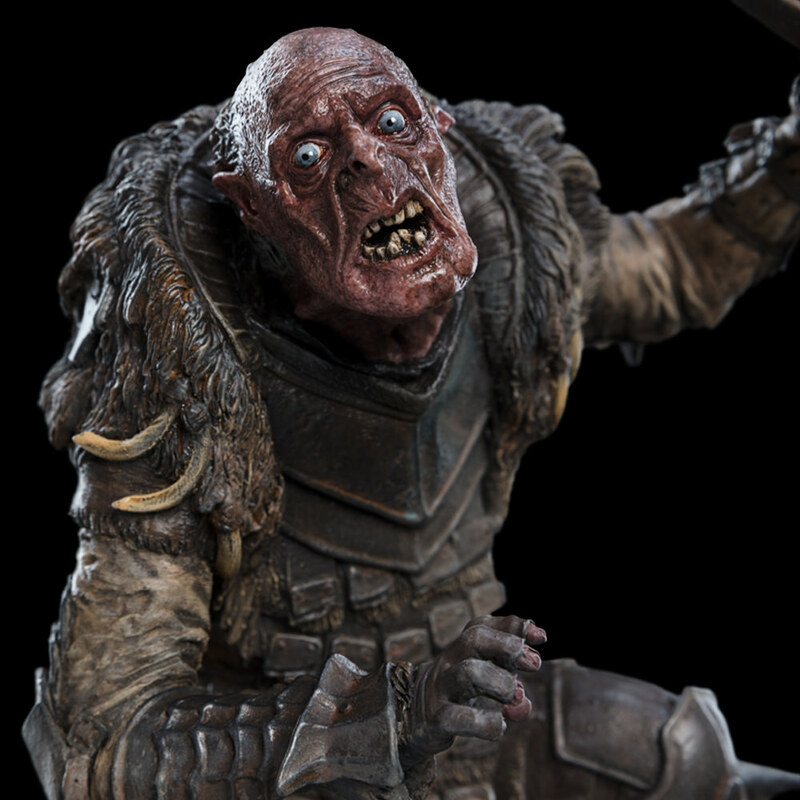 I am thrilled that Weta has created him in poly but I have to ask myself why doesn't he match up to the description of the piece on Weta's website? So where is the spear? It can be clearly seen in the screen capture from the movie. stands complete in 1:6 scale: weapon raised above his captives, moments before he met his death. Also where is the blood on his face? I wonder about why the piece was altered from the film if it was supposed to be portraying him "moments before his death"? Too gruesome? Surely not for me. If this was indeed the pose and moment that that Weta says it was portraying, having him in all his bloody wrath, impalled with a Rohan spear would have been the way to go. If they wanted to just do a generic pose without him being all torn up from the encounter with the Rohan, Weta could have picked a different moment from before the battle. Like the moment that meets the Uruk-hai. Or the moment at the camp right before "meats back on the menu boys". Well, I tend to ramble talking about such things so I will end it here. All that said being set aside, it's a wonderful piece of work and I'm very excited to add him to the rest of my collection. All times are GMT+12. This page was generated at 21:22.